How to make your display child-led and child-centered. Learning opportunities in the early years need to be child-led and child-centered and yet many settings still insist on creating displays that are created by adults or for adults or which have involved children putting together pre-prepared pieces to form near identical finished products. Both the EYFS and the Children’s Act ask that children play an active part in decision making processes and child-led display offers an excellent way of moving towards these goals. 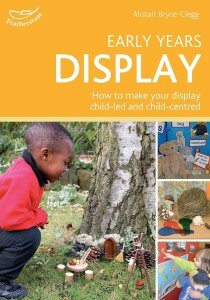 This book will not only give specific examples of displays which actively involve children in their development and which encourage ongoing interaction (to include photographic examples) but it will also address some of the traditional views about display and show how changing these views can lead to display becoming more than just decorative wall covering. It also addresses issues of space and budget and hence is appropriate for all practitioners within early years. Special reference is made to issues encountered by pre-schools who have to pack everything up at the end of session as well as childminders who have limited display space within their own homes.